RIGHT NOW – 15% DISCOUNT! THIS VIDEO IS ABOUT ANOTHER INDUSTRIAL REJUVENATOR THAT HAD AN AUTO LOAD-CYCLE FEATURE. WE HAD A 24A AND 30A UNIT THAT ARE DISCONTINUED AND THE 25A12 REJUVENATOR REPLACES BOTH OF THEM. THE 25A12 IS ONLY THE REJUVENATOR SO YOU MUST MANUALLY CYCLE THE BATTERIES TO GAIN MAX CAPACITY. This industrial charger charges and restores the capacity of medium to large 12 Volt Lead-Acid batteries. This work horse can rapidly break down layers of sulfation and restore the battery’s capacity. 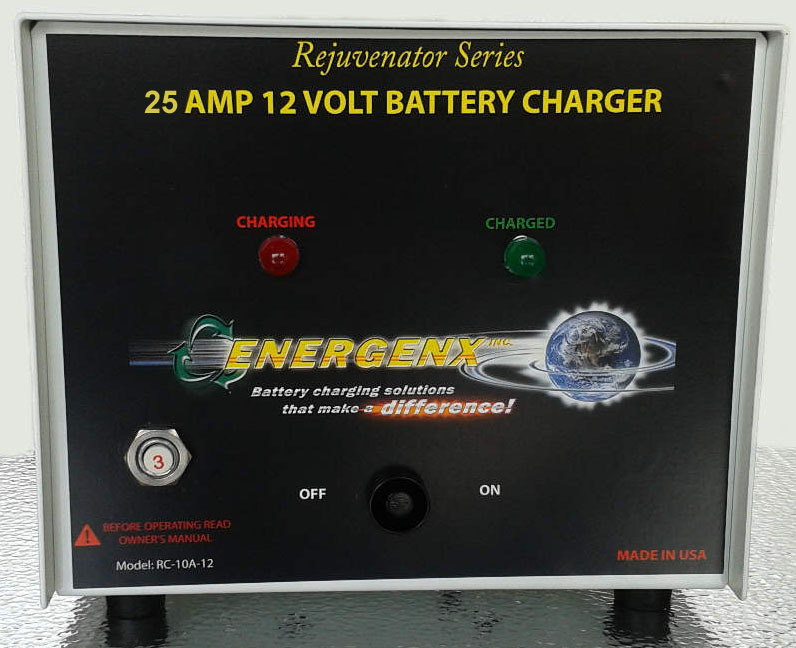 We recommend that you use the 12V Battery Load Box to cycle the batteries for full rejuvenation. This rapid restoration of capacity is what we call Rejuvenation. There is no other battery charging system in the world that can do this! Available in both 120v or 240v. The power supply will be wired properly for the voltage of your country unless you ask for something different. 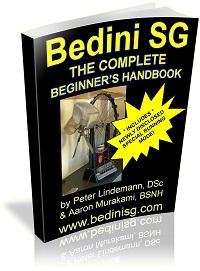 See owner’s manual for more details. Unit weighs: 39 lbs, 2 oz. My name is Martin Torres, and I have several questions regarding Tesla Chargers for a forklift Battery. Hi Martin, go ahead and post your questions here or email them to info@ (the domain name for this website). I have several 36 V 750 Ah traction batteries and I am wondering if I can use several 25A12A Tesla Chargers in Series to charge those batteries, I need to decide very fast because I need to buy one charges in this moment and would like to try Tesla Chargers. Txs for the support. Hi Martin, these chargers aren’t designed to be used in series like that. Are your batteries 6 or 12 in series? I would use a single 25A12 and charge 12v at a time. If you are able to get multiple 25A12s then you can charge multiple 12v strings at a time. It’s not a good idea to put multiple 12v strings in parallel but one 12v string at a time. The batteries are themselves 36 Volts, not 12V or 6V strings, so I guess there is no way to use these Tesla chargers on those, right ? It might be possible to connect them inside of the plates at 12v intervals – thru the refilling ports. 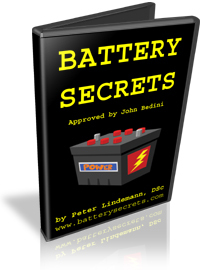 John Bedini has a 2 volt system that he tested for big forklift batteries and was for 1 cell at a time. I’ll ask about this – going out to see John tomorrow. What is the exact brand of your battery? If you can find a google image link to the exact one, that would be helpful. Actually they are several brands, but all look the same as big 1 Ton Metal Box with 18 individual cells all linked together, let me take some pics…., but I do not know how to attach them. Then you can connect to any voltage you want such as 6 x 2 volt cells for 12v. I’ll confirm details tomorrow, but I don’t see an issue with doing this if you have this kind of setup. That is a 48v bank in the pic made of of 24 X 2v cells. Yours is probably 18 x 2v cells in a similar arrangement. Hi Martin, you can use the 25A12 for this battery by connecting it across 6 cells at a time. If you have one 25A12, then yes, charging time is triple. If you have 3 X 25A12’s, then you can connect each one across 6 cells to charge them all up at the same time. My name is Gustavo, I am Brazilian. I have several batteries TROJAN 6V / 315A (model: J305 G – AC), and I want to get them because they are no longer holding charge. Which product I could buy to make this recovery of deep cycle lead acid batteries? If you use two batteries in series resulting in 12V / 315A, and put on yet another parallel to this association to form 12V / 630Ah. This charger can handle this load? 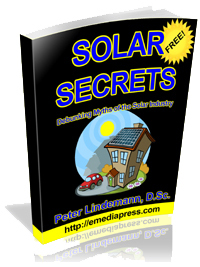 Or should you use the combination of two just in series, 12V / 315Ah. How long the batteries would be charged? And the life of them after the load with this radiant power charger? I’m waiting, I wondered how it would be sending that product. my ZIP code: 29164430, Espírito Santo – Brazil.